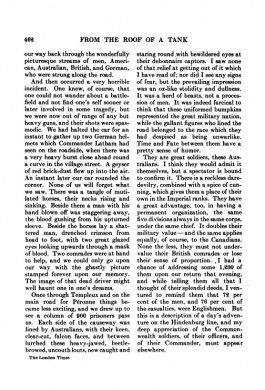 The Rent in the Line is an article written by Arthur Conan Doyle first published in The Times on 3 october 1918. A PICTURE OF THE GREAT BATTLE. FROM THE ROOF OF A TANK. The grand, sonorous, mystical lines of Julia Ward Howe rang in my head as I found myself by most unlooked-for chance an actual eye-witness of this, one of the historical episodes of the greatest of wars. Yes, with my own eyes I saw the rent while the men who made it were still pushing forward from the farther side of it. Even now I can hardly realize that it was so. 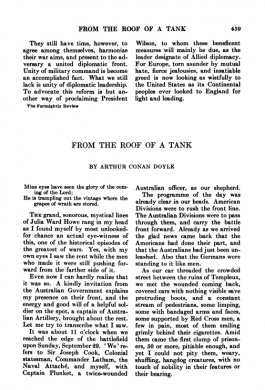 A kindly invitation from the Australian Government explains my presence on their front, and the energy and good will of a helpful soldier on the spot, a captain of Australian Artillery, brought about the rest. Let me try to transcribe what I saw. It was about 11 o'clock when we reached the edge of the battlefield upon Sunday, September 29. "We" refers to Sir Joseph Cook, Colonial statesman, Commander Latham, the Naval Attaché, and myself, with Captain Plunket, a twice-wounded Australian officer, as our shepherd. The programme of the day was already clear in our heads. American Divisions were to rush the front line. The Australian Divisions were to pass through them, and carry the battle front forward. 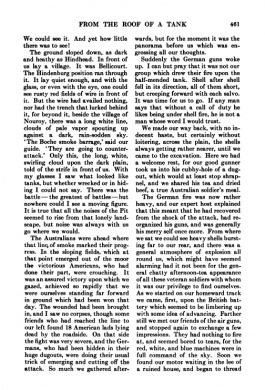 Already as we arrived the glad news came back that the Americans bad done their part, and that the Australians had just been unleashed. Also that the Germans were standing to it like men. As our car threaded the crowded street between the ruins of Templeux, we met the wounded coming back, covered cars with nothing visible save protruding boots, and a constant stream of pedestrians, some limping, some with bandaged arms and faces, some supported by Red Cross men, a few in pain, most of them smiling grimly behind their cigarettes. Amid them came the first clump of prisoners, 50 or more, pitiable enough, and yet I could not pity them, weary, shuffling, hangdog creatures, with no touch of nobility in their features or their bearing. The village was full of Americans and Australians, extraordinarily like each other in type. One could well have lingered, for it was all of great interest, but there were even greater interests ahead, so we turned up a hill, left our ear, which had reached its limit, and proceeded on foot. The road took us through a farm, where a British anti-aircraft battery stood ready for action. There we found open plain, and went forward, amid old trenches and rusty, wire, in the direction of the battle. We had now passed the heavy gun positions, and were among the field guns, so that the noise was deafening. A British howitzer battery was hard at work, and we stopped to chat with the major. His crews had been at it for six hours, but were in great good-humour, and chuckled mightily when the blast of one of their guns nearly drove in our ear-drums, we having got rather too far forward. The effect was, that of a ringing box on the exposed car — with which valediction we left our grinning British gunners and pushed on to the east, under a screaming canopy of our own shells. The wild, empty waste of moor was broken by a single shallow quarry or gravel-pit, in which we could see some movement. In it we found an advanced dressing station, with about a hundred American, and Australian gunners and orderlies. There were dug-outs in the sides of this flat excavation, and it had been an American battalion H.Q. up to a few hours before. We were now about a thousand yards from the Hindenburg Line, and I learned with emotion that this spot was the Egg Redoubt, one of those advanced outposts of General Gough's Army which suffered so tragic and glorious a fate in that great military epic of March 21 - one of the grandest in the whole war. The fact that we were now standing in the Egg Redoubt showed me, as nothing else could have done, how completely the ground had been recovered, and how the day of retribution was at hand. We were standing near the eastward lip of the excavation, and looking over it, when it was first brought to our attention that it took two to make a battle. Up to now we had seen only one. Now two shells burst in quick succession 40 yards in front of us, and a spray of earth went into the air. "Whizz-bangs," remarked our soldier guide casually. Personally, I felt less keenly interested in their name than in the fact that they were there at all. 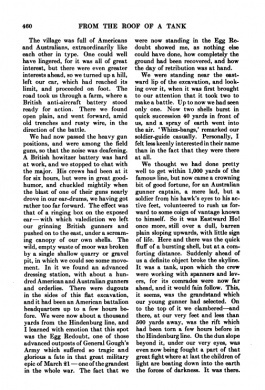 We thought we had done pretty well to get within 1,000 yards of the famous line, but now came a crowning big of good fortune, for an Australian gunner captain, a mere lad, but a soldier from his hawk's eyes to his active feet, volunteered to rush us forward to some enigm of vantage known to himself. So it was East-ward Ho ! once more, still over a dull, barren plain sloping upwards, with little sign of life. Here and there was the quick fluff of a bursting shell, but at a comforting distance. Suddenly ahead of us a definite object broke the skyline. It was a Tank, upon which the crew were working with spanners and levers, for its comrades were now far ahead, and it would fain follow. This, it seems, was the grand stand which our young gunner had selected. On to the top of it we clambered - and there, at our very feet and less than 500 yards away, was the rift which had been torn a few hour before in the Hindenburg line. On the dun slope beyond it, under our very eyes, was even now being fought a part of that great fight where at last the children of light are beating down into the earth the forces of darkness. It was there. We could see it. And yet how little there was to see ! The ground sloped down, as dark and heathy as Hindhead. In front of us lay a village. It was Bellicourt. The Hindenburg position ran through it. It lay quiet enough, and a with the glass, or even with the eye, one could see rusty red fields of wire in front of it. But the wire had availed nothing, nor had the trench that lurked behind it, for beyond it, beside the village of Nouroy, there was a long white line, clouds of pale vapour spouting up against a dark, rain-sodden sky. "The Boche smoke barrage." said our guide. "They are going to counter-attack." Only this, the long, white, swirling cloud upon the dark plain, told of the strife in front of us. With my glasses I saw what looked like Tanks, but whether wrecked or in hiding I could not say. There was the battle - the greatest of battles - but nowhere could I see a moving figure. It is true that all the noises of the Pit seemed to rise from that lonely landscape, but noise was always with us, go where we would. The Australians were ahead where that line of smoke marked their progress. In the sloping fields, which at that point emerged out of the moor, the victorious Americans, who had done their part were crouching. It was an assured victory upon which we gazed, achieved so rapidly that we were ourselves standing far forward in ground which had been won that day. The wounded had been brought in, and I saw no corpses, though some friends who had reached the line to our left found 18 American lads lying dead by the roadside. On that side the fight was very severe, and the Germans, who had been hidden in their huge dug-outs, were doing their usual trick of emerging and cutting off the attack. So much we gathered afterwards, but for the moment it was the panorama before us which was engrossing all our thoughts. Suddenly the German guns woke up. I can but pray that it was not our group which drew their fire upon the half-mended Tank. Shell after shell fell in its direction, all of them short, but creeping forward with each salvo. It was time for us to go. If any man says that without a call of duty he likes being under shell tire, he is not a man whose word I would trust. We made our way back, with no indecent haste, but certainly without loitering, across the plain, the shells always getting rather nearer, until we came to the excavation. Here we had a welcome rest, for our good gunner took us into his cubby-hole of a dug-out, which would at least stop shrapnel, and we shared his tea and dried beef, a true Australian soldier's meal. The German fire was now rather heavy, and our expert host examined that this meant that he had recovered from the shock of the attack, had reorganized his guns, and was generally his merry self once more. From where we sat we could see heavy shells bursting far to our rear, and there was a general atmosphere of explosion all round us, which might have seemed alarming had it not been for the general chatty afternoon-tea appearance of all these veteran soldiers with whom it was our privilege to find ourselves. As we started on our homeward track we came, first, upon the British battery which seemed to be limbering up with some idea of advancing. Farther still we met our friends of the air guns, and stopped again to exchange a few impressions. They had nothing to fire at, and seemed bored to tears, for the red, white, and blue machines were in full command of the sky of the sky. Soon we found our motor waiting in the lce of a ruined house, and began to thread our way back through the wonderfully picturesque streams of men. American, Australian, British, and German, who were strung along the road. And then occured a very horrible incident. One knew, of course, that one could not wander about a battlefield and not find oneself sooner or later invoked in some tragedy, but we were now out of range of any but heavy guns, and their slots were spasmodic. We had halted the car for an instant to gather up two German helmets which Commander Latham had seen on the road-side, when there was a very heavy burst close ahead round a curve in the village street. A geyser of red brick-dust flew up into the air. An instant later our car rounded the corner. None of us will forget what we saw. There was a tangle of mutilated horse, their necks rising and sinking. Beside them a man with his hard blown off was staggering away, the blood gushing from his upturned sleeve. Beside the horses lay a shattered man, drenched crimson from head to foot, with two great glazed eyes looking upwards through a mask of blood. Two comrades were at hand to help and we could only go upon our way with the ghastly picture stamped for ever upon our memory. The image of that dead driver might well haunt one in one's dreams. Once through Templeux and on the main road for Péronne things became less exciting and we drew up to see a column of 900 prisoners pass us. Each side of the causeway was lined by Australians, with their keen, clear-cut, falcon faces, and between lurched these heavy-jawed, beetle-browed, uncouth louts, new caught and staring round with bewildered eyes at their debonnaire captors. I saw none of that relief at getting out of it which I have read of ; nor did I see any signs of fear, but the prevailing impression was an ox-like stolidity and dullness. It was a herd of beasts, not a procession of men. It was indeed farcical to think that these uniformed bumpkins represented the great military nation, while the gallant figures who lined the road belonged to the race which they had despised as being unwarlike. Time and Fate between them have a pretty sense of humour. They are great soldiers, these Australians. I think they would admit it themselves, but a spectator is bound to confirm it. There is a reckless daredevilry, combined with a spice of a cunning, which gives them a place of their own in the Imperial ranks. They have a great advantage, too, in having a permanent organization, the same five divisions always in the same corps, under the same chief. It doubles their military value - and the same applies equally, of course, to the Canadians. None the less, they must not undervalue their British comrades or lose their sense of proportion. I had a chance of addressing some 1,200 of them upon our return that evening, and while telling them all that I thought of their splendid deeds, I ventured to remind them that 72 per cent. of the men, and 76 per cent. of the casualties, were Englishmen. But this is a description of a day's adventure on the Hindenburg line, and my deep appreciation of the Commonwealth soldiers, of their officers, and of their Commander, must appear elsewhere. This page was last edited on 3 October 2018, at 18:24.